Brooding day-old-chicks during the cold winter months can prove to be an expensive proposition. It can be very tempting to lower house temperature a few degrees to help reduce heating costs but most people don’t realize how little of an impact this would actually have on heating cost. 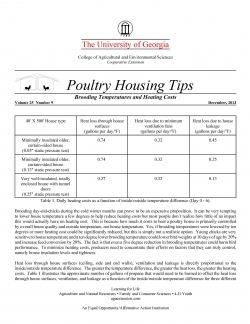 This is because how much it costs to heat a poultry house is primarily controlled by overall house quality and outside temperature, not house temperature. Yes, if brooding temperatures were lowered by ten degrees or more heating cost could be significantly reduced, but this is simply not a realistic option. Young chicks are very sensitive to house temperature and a ten degree lower brooding temperature could lower bird weights at 10 days of age by 20% and increase feed conversion by 20%. The fact is that even a five degree reduction in brooding temperatures could harm bird performance. To minimize heating costs, producers need to concentrate their efforts on factors that they can truly control, namely house insulation levels and tightness. Heat loss through house surfaces (ceiling, side and end walls), ventilation and leakage is directly proportional to the inside/outside temperature difference. The greater the temperature difference, the greater the heat loss, the greater the heating costs. Table 1 illustrates the approximate number of gallons of propane that would need to be burned to offset the heat loss through house surfaces, ventilation, and leakage as a function of the inside/outside temperature difference for three different styles of 40' X 500' houses during partial house brooding. To obtain an estimate of the daily propane usage associated with heat loss through house surfaces, leakage and ventilation table values are simply multiplied by the inside/outside temperature difference. For example, if you had an older, fairly loose, curtain-sided house and it was 90oF inside and 40oF outside, to estimate how many gallons you would need to burn to offset the heat loss through house surfaces over a 24-hour period, 0.74 would be multiplied by the 50oF temperature difference (0.74 X 50 = 37 gallons). To estimate how much propane would be used due to heat lost through ventilation and leakage the 50oF temperature difference would be multiplied by 0.32 (0.32 X 50 = 16 gallons) and 0.45 (0.45 X 50 = 23 gallons), respectively. To determine the dollar value of the heat loss the number of gallons burned per day would be simply multiplied by the cost of a gallon of propane (Table 2). If propane costs $2 per gallon, during brooding in a minimally insulated, fairly loose house, one would expect to have to spend approximately $74 (37 gallons X $2 per gallon) to offset the heat loss through the house surfaces, $32 to heat the cold air brought by minimum ventilation fans, and $45 to heat all the cold air entering through holes and cracks in the house, for a total heating cost of $151 per day. If the house were made tighter, heating costs associated with heat loss due to ventilation and building surfaces would remain the same but, since less cold air would be leaking into the house the total heating costs would be reduced by $20 per day, a nearly 15 percent reduction (Table 2). But if the house were totally enclosed and the level of ceiling insulation were increased, the total heating costs would be reduced from $151 per day to $72 per day, over a 50% reduction (Table 3). If instead of being 40oF outside it was 60oF, the temperature difference would decrease from 50oF to 30oF and the heating costs would be reduced proportionally, 40%. Conversely, if house temperature were increased from 90oF to 95oF the temperature difference would be increased from 50oF to 55oF, resulting in a 10% increase in heating cost. It all comes down to the simple fact that heating costs are determined not as much by what inside temperature you keep but more so by what is happening outside. For example, many might view a five degree increase in brooding temperature as substantial, but in reality it wouldn’t increase heating costs nearly as much as what is caused by typical day-to-day or day-to-night variations in outside air temperatures, or for that matter changes to house insulation levels or tightness. Though a five degree decrease in brooding temperatures may not significantly reduce heating costs, it can have a significant effect on chick performance. Chicks that are brooded at slightly lower temperatures will eat more feed than those brooded at proper temperatures, but instead of that feed being used for growth, it is being used by the chick to keep warm, which will lead to reduced growth rates and poorer feed conversions. Even if proper house temperatures are maintained the remainder of the flock, research has shown birds that have lower seven day body weights due to cold stress will not catch up by the end of the flock. Studies have demonstrated that brooding at 85oF vs 90oF the first week can result in feed conversion differences of two points or more and lower body weights. The high yielding broiler lines being used today are much more sensitive to temperature and respond very well to higher brooding temperatures. This can be demonstrated by the differences of up to four percent in seven day mortality. Chicks that are too cool not only will use more feed to stay warm, but will tend to huddle rather than move about in search of feed and water resulting in a larger percentage of mortality due to starve out. Heating costs are primarily determined by outside temperature and house condition. Obviously a producer has no control over outside temperatures and as a result there will be limitations to how much one can control heating costs. From a practical standpoint producer also has limited flexibility over the inside temperatures because for optimal bird performance there is a very limited range of acceptable temperatures especially for younger birds. The best way to reduce heating costs is to make a house as tight as possible to eliminate excessive cold air entering a house and make sure that a house is properly insulated.